It appears that the approval of Greece’s austerity measures has finally halted the correction in the stock market. But has it really? I would suggest that this correction has never been about Greece. The market has known for over a year that Greece would be back looking for more money. Let’s face it no one is under any delusions that Greece is going to be able to solve their problems. Greece is going to default, there’s no avoiding that. What the EU is trying to avoid is a domino effect of cascading sovereign debt crises. Last summer the crisis was solely centered around Greece. Does anyone really believe that this is going to stop with Greece this year? I doubt it. I suspect in the next week or two were going to see bond yields spike in Spain or Italy or Portugal, or maybe in all of the PIIGS. What started as a financial crisis in `08 has now infected sovereign debt as countries around the world have acted to bail out the banking system. I really doubt that this is going to start, and stop, with Greece again this year. As we found out during the real estate bust, there is never only one cockroach. Striking similarities to last years correction are now starting to pop up. 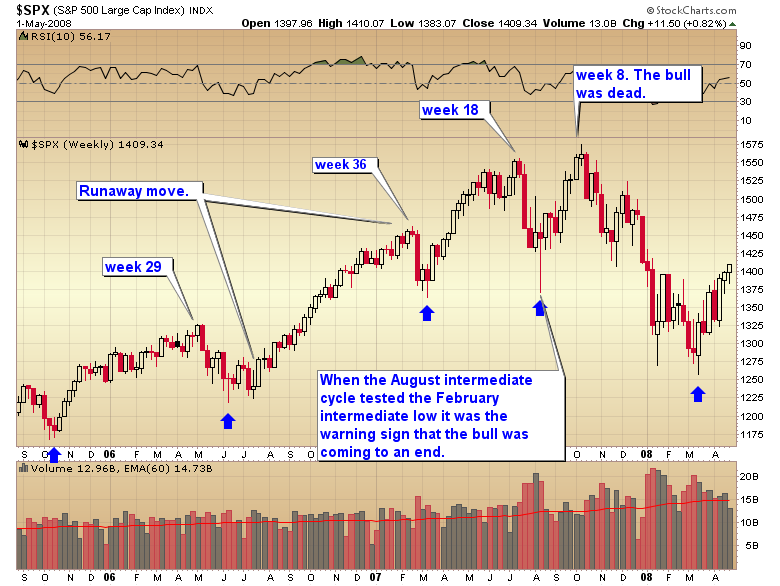 In May of last year the market put in what looked like a final intermediate low. It was followed by a higher low and higher high. The only problem was that the daily cycle was too short for the May bottom to be a final cycle trough as the bottom had occurred on day 13 and a normal daily cycle runs 35 to 45 days. I also noted on the chart that we saw a large selling on strength day (smart money distribution day) one week from the top. The market then proceeded to move down into a final intermediate low in the normal timing band. I can tell you that many technicians got caught during the May bounce. Now take a look at the current chart. 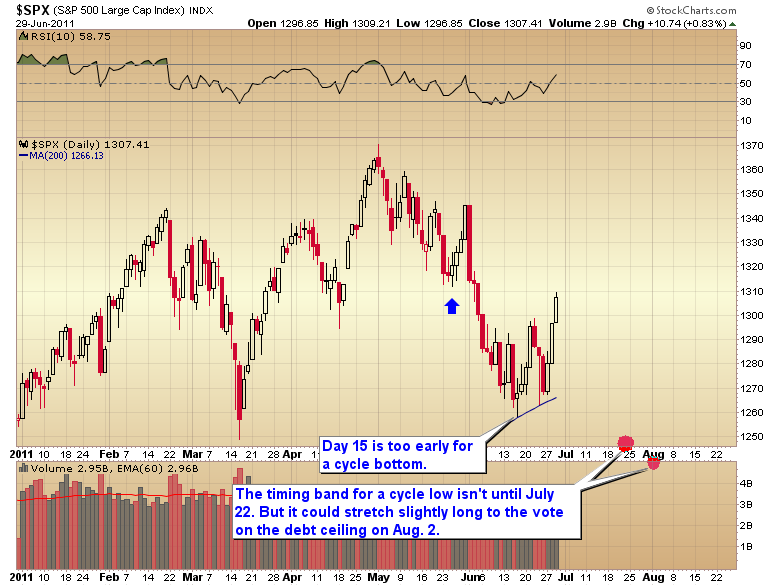 This time the market appears to have bottomed on the 15th day of its daily cycle. Again we have a pattern of higher lows and higher highs, convincing technicians that the bottom is in. Also note that we have another large distribution day just like we saw last year. We have been expecting some kind of counter trend rally all along because sentiment had become too bearish by the middle of June. In order for the market to continue lower we were going to have to see some kind of relief rally to work off the oversold technical and sentiment conditions. The question is, is the rally for real or is it a counter trend move to be followed by another leg down. In bear markets the counter trend moves are very convincing. I tend to think that this is probably not over yet. If the daily cycle runs a normal duration then we should look for a final bottom somewhere around July 22. However Congress is going to vote on the debt ceiling August 2. It’s possible that this daily cycle could stretch just a bit long and bottom on that vote. Traders should probably be careful about placing too much trust in charts right now. Last year trading the charts suckered investors into the counter trend rally only to drag them down into a final intermediate bottom. One final note. 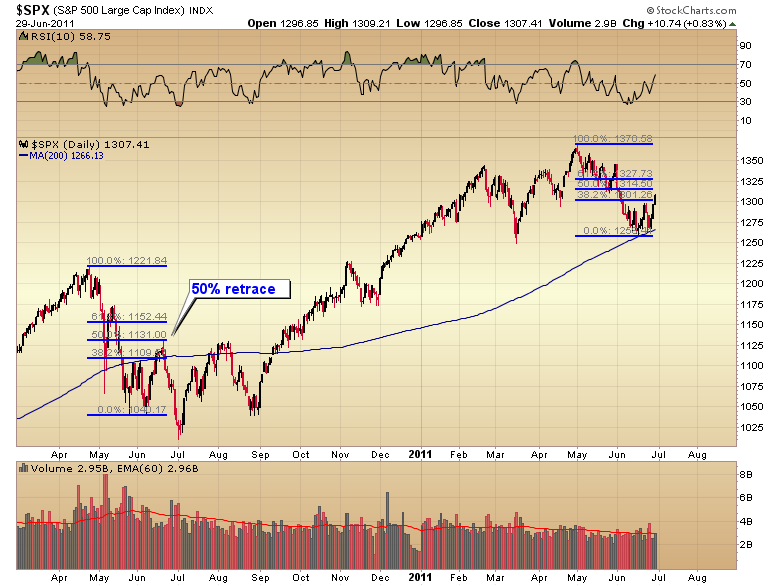 The market is now nearing the 50% retracement level. This is the same level that turned back the market last year. This entry was posted in Uncategorized on June 30, 2011 by Gary. Radio interview with Tekoa Da Silva of the Contrary Investors Café. This entry was posted in Uncategorized on June 28, 2011 by Gary. Today I am going to teach you a little about cycles. First a little background information. I’m going to be discussing almost exclusively the intermediate degree cycle. Now to start let me correct some misconceptions. Cycles are virtually worthless for timing tops. Cycles are measured from trough to trough. All we can really do with cycle theory is develop timing bands for bottoms, tops can occur at any time. Next I want to go over the concept of left and right translated cycles as it is pertinent to what is happening in the stock market. Now in order to understand how a cycle is translated you first have to determine the average duration of the cycle. In our case we are going to focus on the intermediate degree cycle in the stock market. That cycle averages 20 to 25 weeks trough to trough. The median being 22 weeks. If we divide 22 weeks by 2 we come up with 11 weeks. That is an important number. It is the dividing line between a left translated cycle and a right translated cycle. Any cycle that tops on week 12 or later constitutes a right translated cycle. 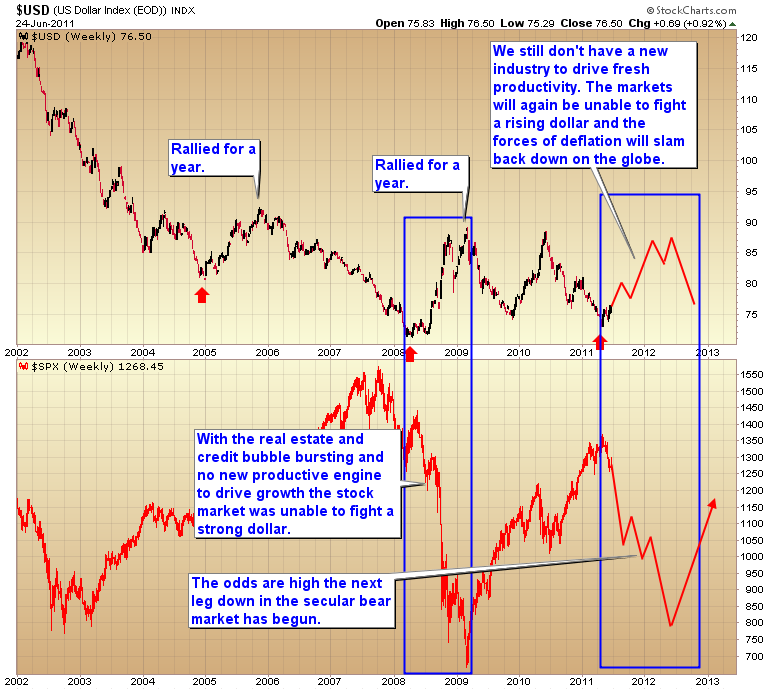 Right translated cycles are the hallmark of bull markets. Let me explain. In a healthy bull market an intermediate degree correction is a profit-taking event, and that’s all it is. The media will find some scary reason for why the market is correcting but the real truth is that the market has just rallied long enough and far enough and is due a corrective move to consolidate the gains. There is one exception, which I will go over in a minute. Healthy bull markets are composed of multiple right translated intermediate cycles. Left translated cycles, on the other hand, are the hallmark of markets that are in trouble. A left translated cycle is a sign that the fundamentals of the market are broken, or in the process of breaking. A left translated cycle is not a profit-taking event. A left translated cycle is a sign that institutional money is selling into the rally. Next I’m going to show you the 2002 to 2007 bull market. The intermediate cycle troughs are marked with blue arrows. 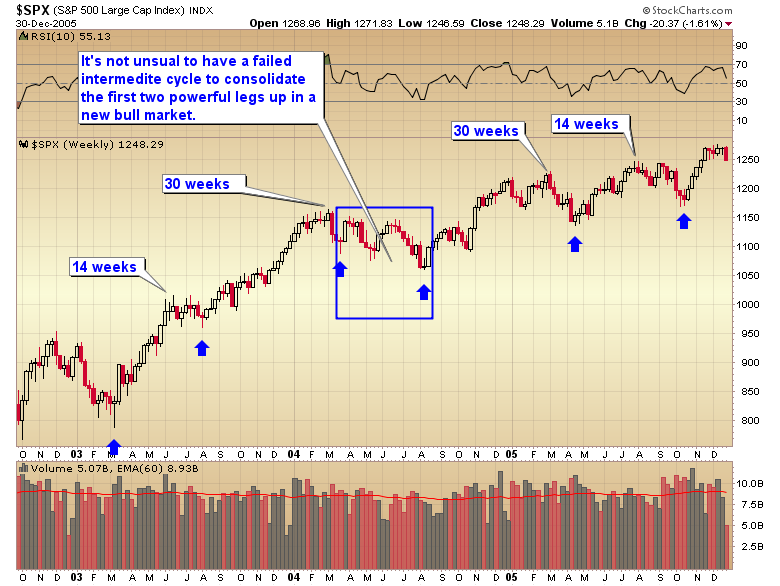 In the chart below you can clearly see that every intermediate cycle, with one exception, rallied more than 12 weeks. This is a sign of a healthy bull market. The rallies are moving to new highs. When the intermediate rallies mature they top late in the cycle followed by a profit-taking event that holds well above the prior intermediate trough. The one exception, and I have marked it with the blue box, is that sometimes an intermediate cycle will top in a left translated manner and make a lower low after the second leg up in a new bull market. This is just a sign of a market that needs to consolidate a huge move out of a bear market bottom. Next, let’s move into the latter stages of the 2002-2007 bull market. Again we see the familiar pattern of higher highs and higher lows, and intermediate cycles that are topping deep into their intermediate cycles. However, in the summer of 07 something happened that was a glaring warning sign that the cyclical bull market was in trouble. And that sign; the summer intermediate cycle dropped all the way down to test the prior cycle low in February. In a healthy bull market that should not happen. As you recall this was right about the time that subprime mortgages began imploding. Smart money could read the writing on the wall, and they began exiting the market. The deathblow came when the next intermediate cycle topped in an extreme left translated manner on week eight. That was the warning sign that institutional buyers had left the market. At that point the bull had officially died. Now let’s take a look at the current bull market. 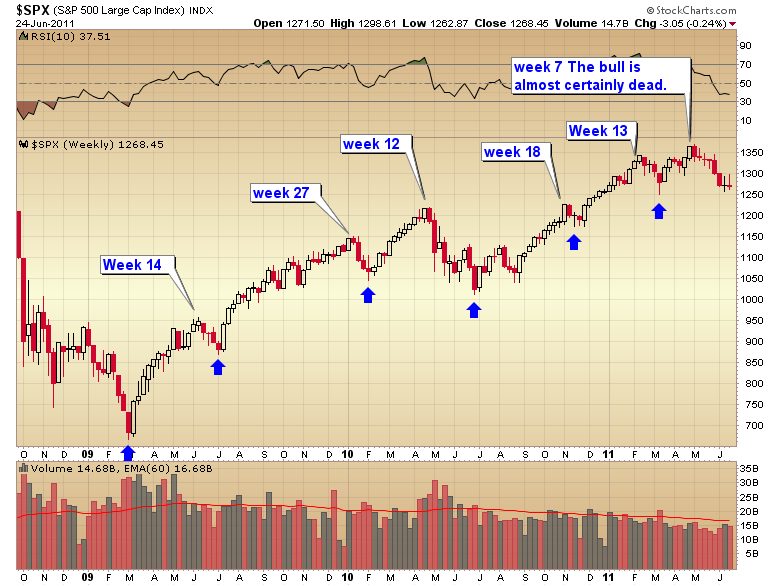 Up until last summer this was a healthy bull market. The intermediate cycles were all right translated, and we were making higher highs and higher lows. Last summer that started to change. To begin with the intermediate cycle topped on week 12, right on the dividing line of right and left translation. The market had managed to rally 16%, so even though time wise it was a bit early for an intermediate decline, in magnitude a 16% rally is enough to trigger a profit-taking event. However, this did not turn into just a normal profit-taking event. The decline moved below the February intermediate cycle low. Alarm bells started to ring and Bernanke he heard it. Thus began QE2 and the markets were pulled back from the brink… temporarily. I don’t think anyone is under any delusions about what has powered this bull market and propped up a deeply flawed economy. Trillions and trillions of freshly printed dollars that’s what. But that is now coming to an end. Does anyone really believe that the economy or the stock market can continue to levitate without a constant flood of liquidity? If you do I have some beachfront property I want to sell you here in Las Vegas. The market doesn’t believe either! 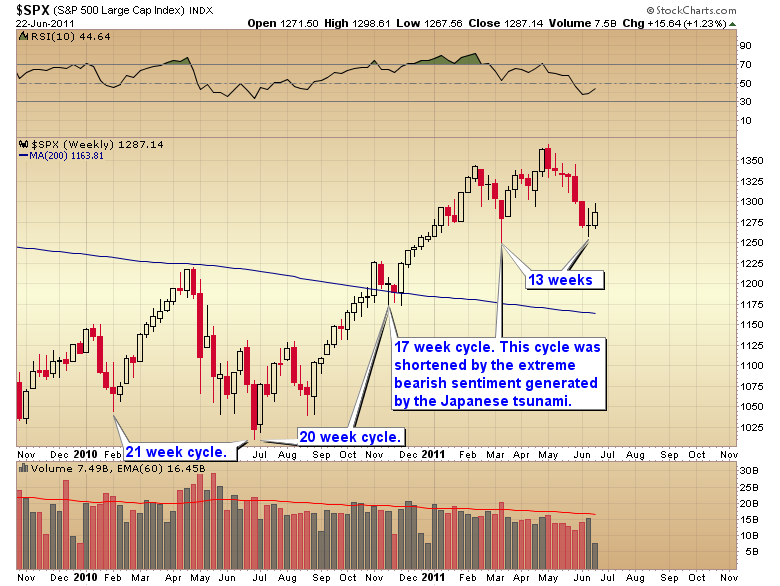 We now have an extreme left translated intermediate cycle in progress that topped on week eight. Notice how the rally out of the March bottom was only able to make marginal new highs with absolutely no follow-through. That is a sign that institutional traders sold into the breakout. And now we have a market that is on the verge of penetrating a prior intermediate cycle low. If the March low gets breached we will have the first confirmation that a new bear market has begun. The second confirmation will come if both the industrials and transports close below the March lows. That would constitute a Dow theory sell signal. The last confirmation will come when the 50 day moving average moves below the 200 day moving average and the 200 day moving average turns down. Next I want to look at the dollar. In a deflationary environment the value of currency rises. As many of you know I have been predicting a major three-year cycle low for the dollar to occur in the spring or early summer of this year. It came during the first week of May. These major cycle bottoms tend to produce very powerful rallies, often lasting up to a year. Now if we were just coming out of recession and productivity was increasing, or we had a new industry that was creating massive job growth then yes I would expect the market to be able to resist a rising dollar. Actually in that scenario a rising dollar is signaling a healthy economy. In our current environment however a rising dollar signals deflation! 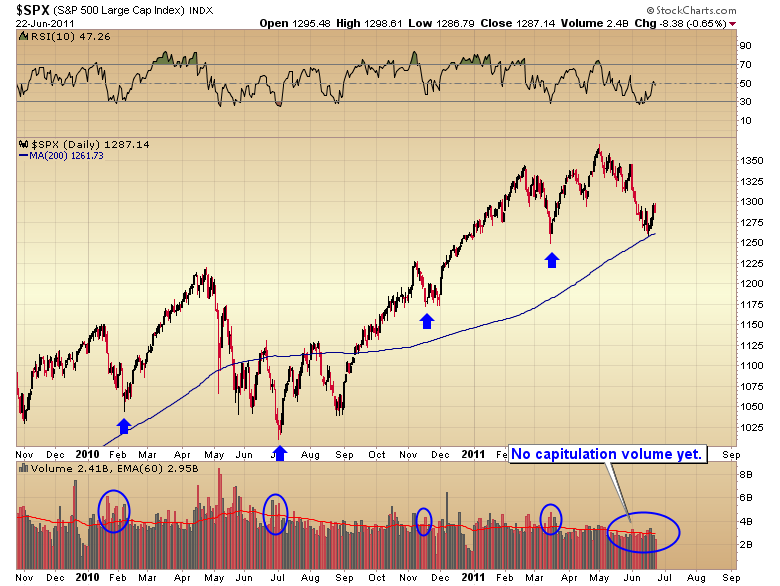 You can see that during the rally out of the `08 three year cycle low the stock market came under severe pressure. I think it’s safe to say that the same thing is going to happen this time as the dollar rallies. Unfortunately, we don’t have a new industry to drive job growth, power a sustainable economy, and allow the markets to resist a rising dollar. All we have is commodity inflation created by the Fed in a vain attempt to print prosperity. I’ve been warning for months that once the dollar bottomed and started to rally it would signal the end of the bull market and the start of the third leg down in the secular bear market. At this point I think the only hope the Bulls have is for Bernanke to turn the dollar back down into an extreme left translated three-year cycle. Unfortunately, he has decided to turn off the money spigot (don’t worry he will be turning it back on soon, although by then it will be too late). Let us all hope that Bernanke has at least some modicum of common sense left. To turn the dollar back down into a left translated three-year cycle this early will almost certainly destroy the currency by 2014. Not to mention the dollar will lose reserve currency status. actually that is my next big macro prediction. By 2014, the dollar’s next three year cycle low, Bernanke will have wrecked the currency, and the dollar will no longer be the world’s reserve currency. So far this bear market is progressing as expected. It started with the tech bubble bursting. Transformed into a financial crisis. Has now infected sovereign debt. And will ultimately end in a massive currency crisis. This entry was posted in Uncategorized on June 27, 2011 by Gary. With QE2 coming to an end next week I think we are about to enter a very volatile and critical period in all asset markets. For the next three days I am going to offer everyone a five dollar trial subscription. You will have complete access to the premium website during the trial period, which will include the weekend report with my view of where I think we are headed over the next month along with complete archives back to the beginning of the year and the terminology document, COT spreadsheets, and cycle count charts. If during the trial period you decide the newsletter is not for you just cancel following the directions on the homepage. Your trial subscription will still remain active for three days. If you decide you want to continue receiving the SMT premium newsletter your trial subscription will automatically convert to a $25 monthly subscription at the end of the third day. To sign up for the trial click here. Then click on the subscribe link on the right-hand side of the homepage. You will be linked to the subscriptions options page. Check the five dollar special and then follow the checkout instructions. This entry was posted in Uncategorized on June 25, 2011 by Gary. The 15 month special will end Sunday evening. This entry was posted in Uncategorized on June 24, 2011 by Gary. Make no mistake, the four-day rally we just saw was nothing more than short covering in front of the Fed meeting just in case Bernanke surprised us with QE3. As expected he confirmed that QE2 would end on schedule. The dollar rallied and the market sold off on the news. Folks, I don’t think this is over yet. In the chart below you can see that every intermediate cycle low exhibits some kind of capitulation volume as market participants panic. We clearly have not seen any kind of a panic selloff yet. As a matter of fact volume has been running slightly lower than average. This is not what happens at a true intermediate bottom. The average duration of an intermediate cycle is between 20 and 25 weeks. Two of the last three intermediate cycles bottomed perfectly in that timing band. The March cycle was slightly shortened by the Japanese tsunami which generated tremendous bearish sentiment in a very short time. However there is no serious calamity that should shorten the current cycle. One could claim that the Greek situation is driving the decline, and once it gets resolved the correction will end. I think that’s highly unlikely. The market has known for over a year that Greece is going to default. There’s no surprise there. I suspect the next Black Swan will come in July as Spain, or Portugal, or Irish bond yields spike, or something completely out of the blue occurs, like an implosion of the Australian housing market. It’s in times of stress that flaws in the system break. Since we don’t have any capitulation volume yet, and it’s still too early for the intermediate cycle to have bottomed, the assumption is that this correction isn’t finished. So far the market is still following the template I laid out in “The Bear is Back” post. I expected some kind of counter trend rally to relieve the extreme bearish sentiment levels and oversold conditions. We are getting that rally now (it may have already ended). Once the counter trend rally runs its course the market should have another leg down bottoming in late July to mid August. At that point I expect Bernanke to freak out and initiate QE3. That will be the signal for a more durable, and probably explosive rally. But remember, the most violent rallies occur in bear markets! This entry was posted in Uncategorized on June 23, 2011 by Gary. 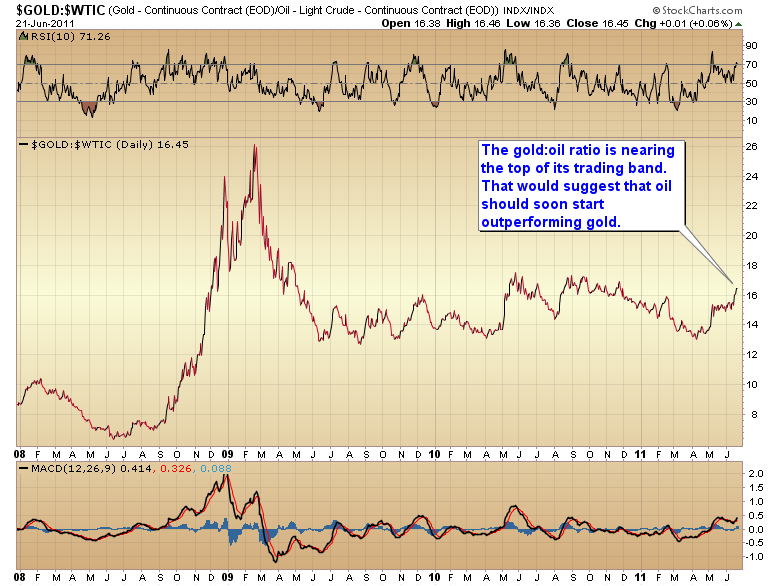 The gold:oil ratio is nearing the upper limits of its trading band. When this level has been reached in the past it usually signaled a decline in gold (move down into an intermediate cycle low) and a rally in oil was eminent. Normally I would expect the same this time as gold is very deep into an intermediate cycle and overdue for a major corrective move. There is a problem though. 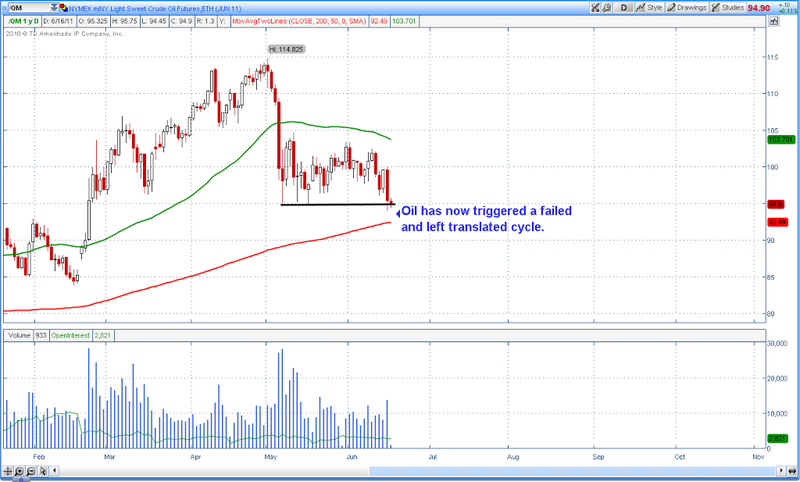 Oil is still very early in its intermediate cycle. Also oil has broken below its prior intermediate cycle low signaling a failed and left translated intermediate cycle is in progress. Taking into consideration a normal intermediate oil cycle lasts 50 to 70 days, and this cycle is only on day 32, then oil should generally continue lower for another 20+ days. As oil and stocks have been moving in lockstep lately it’s not surprising that the stock market’s daily cycle also has 20 or so days before an expected final intermediate bottom. So if the gold:oil ratio is to regress back to the mean, and oil still has a month before an expected bottom the only way the gold oil ratio can decline is if gold starts to accelerate to the downside, dropping significantly faster than oil. This entry was posted in Uncategorized on June 22, 2011 by Gary. I’ve said it before, gold will do everything in its power to draw traders in at intermediate tops. Then it will kick them off at intermediate bottoms. There are a couple of dependable signals that almost always occur during an intermediate degree decline. The first one is a MACD crossover on the weekly charts. Second; gold almost always dips below the 10 week moving average (50 day moving average). You can see in the above chart the divergence that is forming in weekly momentum. Gold is now starting to hug the 10 day moving average, possibly in preparation for a move down into the next intermediate cycle low. 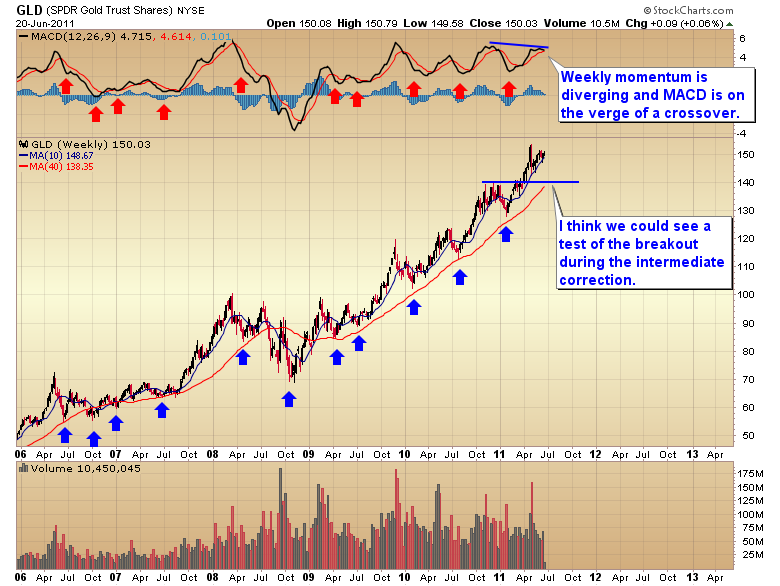 As the current cycle is now 21 weeks old gold is due, actually overdue, for an intermediate degree corrective move. Another tell that occurs is a break of the intermediate trend line. That also has yet to occur. 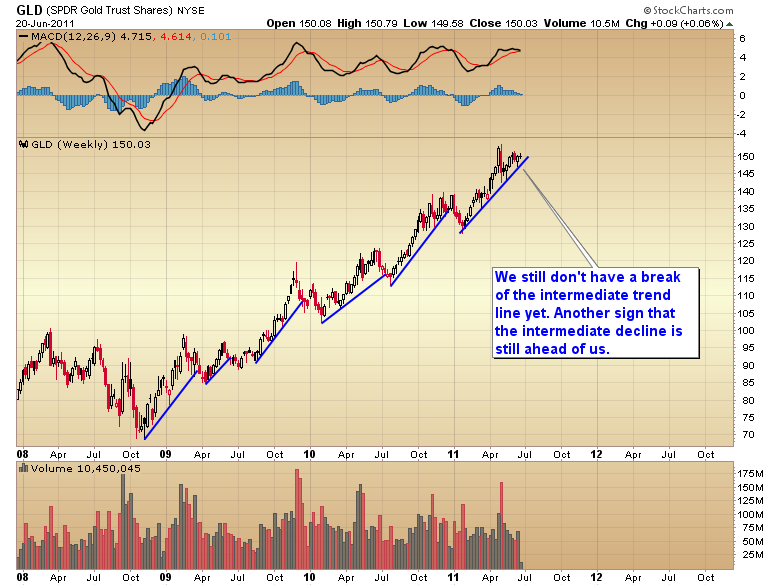 Until we have confirmation that gold has completed its intermediate decline we will remain on the sidelines. This entry was posted in Uncategorized on June 21, 2011 by Gary. A portfolio change is been posted to the website. This entry was posted in Uncategorized on June 16, 2011 by Gary. 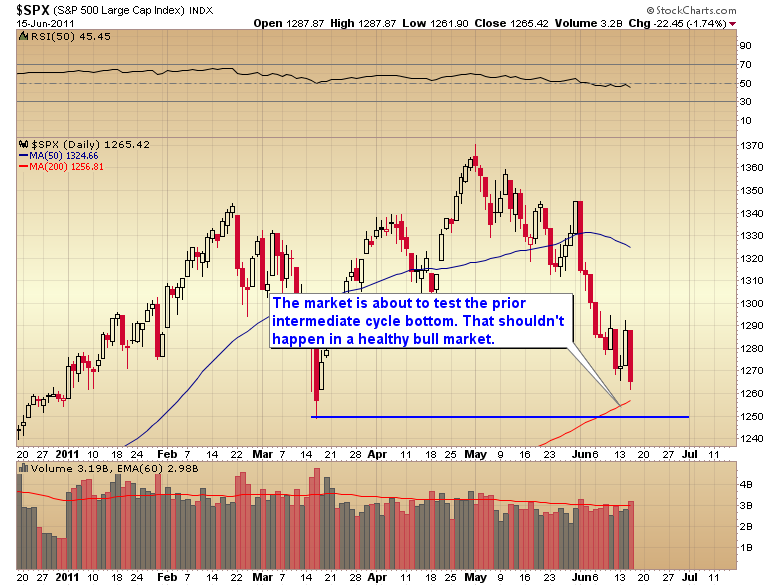 Don’t let the the perma bulls fool you, this is not a normal correction, and it has nothing to do with Greece or Spain. This is the beginnings of the next leg down in the secular bear market and the start of the next economic recession/depression. And this time it’s going to be much much worse than it was in `08. For months now I’ve been warning investors to get out of the general stock market. I was confident that once the dollar put in its three year cycle low the next deflationary period would begin and stocks would enter the third leg down in the secular bear market. Well the dollar did put in the major three year cycle bottom in May and stocks almost immediately started to head down.This won’t end until stocks drop down into the four year cycle low due sometime in mid to late 2012. Let me explain to you what is unfolding so you don’t listen to Wall Street or CNBC and get sucked down into the next bear market. In a healthy bull market intermediate degree corrections hold well above the prior cycle troughs. Higher highs and higher lows. When that pattern of higher highs and higher lows on an intermediate time frame gets violated it is almost always a sign that the market is topping. We are at that stage now as the market is moving down to test the March intermediate cycle low. 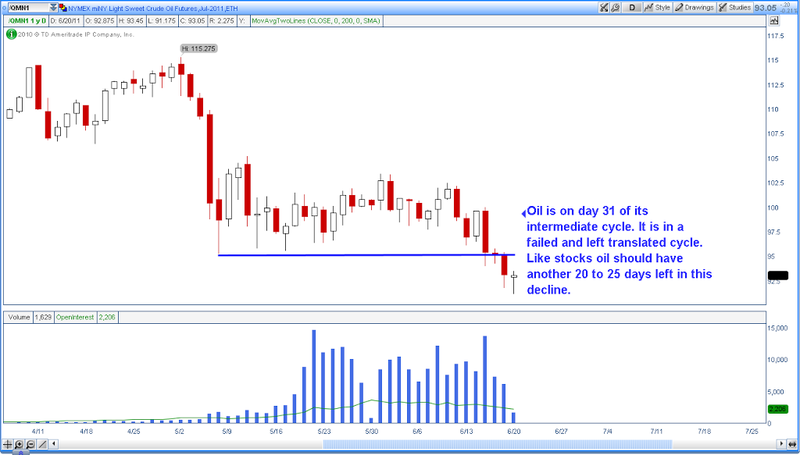 Oil has already violated it’s intermediate bottom. Energy stocks are a big part of the S&P and they are going to be a big drag on the index going forward. In a healthy bull market we shouldn’t even come close to testing the March low. Actually this market hasn’t been healthy since last summer. That was the point at which I recognized the large megaphone topping pattern that was being driven by a double dose of QE. Last year the market was able to push higher for almost a month on momentum after QE1 ended. This market has already rolled over even though QE2 isn’t scheduled to stop until the end of June. 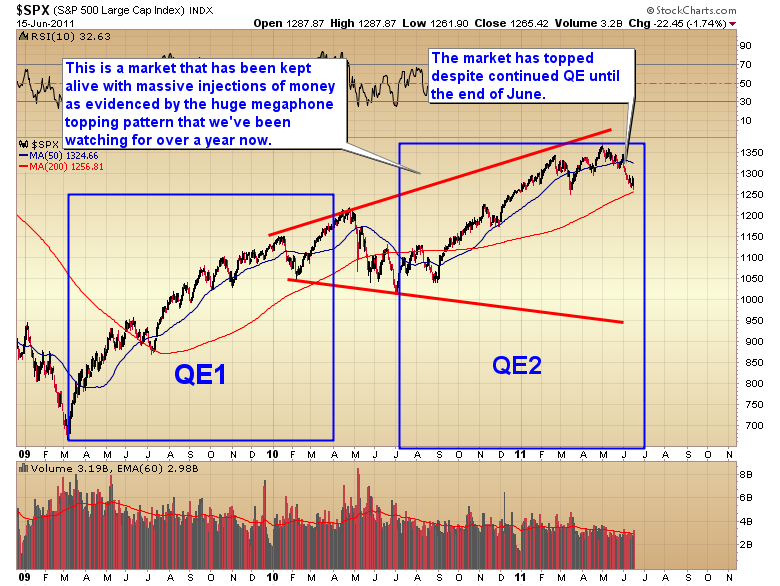 The conclusion is that the market is much weaker now than it was when QE1 ended. We all know what happened last year when the the money pumps were shut off. It led to the flash crash and a severe stock market correction. 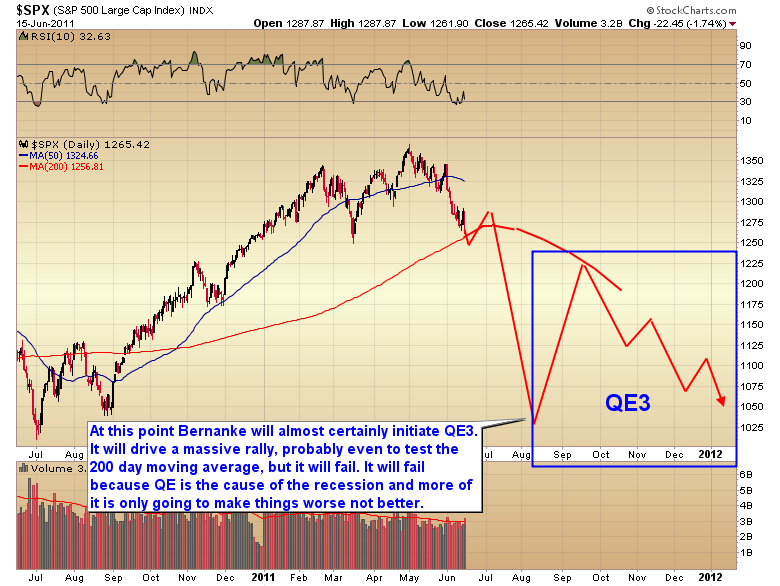 It would have led to a new bear market except Bernanke quickly started QE2. As a matter of fact just like I said it would, QE ultimately spiked commodity inflation, and just like I knew it would commodity inflation has now poisoned the global economy, crushed discretionary spending, squeezed profit margins, and is sending the world down into the next recession. Unfortunately we are entering this recession in a much weaker state than we went into the last one. Real unemployment is somewhere around 12-15%. It is going to get much, much worse. I often wonder how in the world we could appoint such fools to run our monetary policy. I mean seriously, how many times must they make the same mistake before they figure out they are the cause of our problems? Ok enough of the Fed rantings, back to the market. Not only do we have a market that is testing the prior intermediate cycle low when it shouldn’t be, but we also have a clear topping pattern in place. 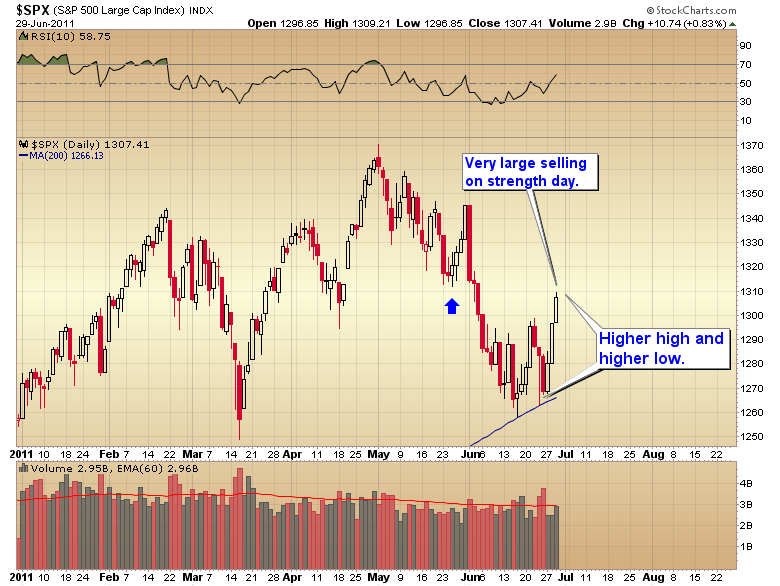 Just like in `07 the market managed a marginal breakout to new highs in May that failed to follow through. You can see the same thing occurred in October of `07. This is quite often how markets top…or bottom for that matter. A technical level is breached, technicians either buy the breakout or sell the breakdown. Smart money fades the move and the market reverses. This is exactly how the `07 top was formed. It’s also how the market bottomed in `02. 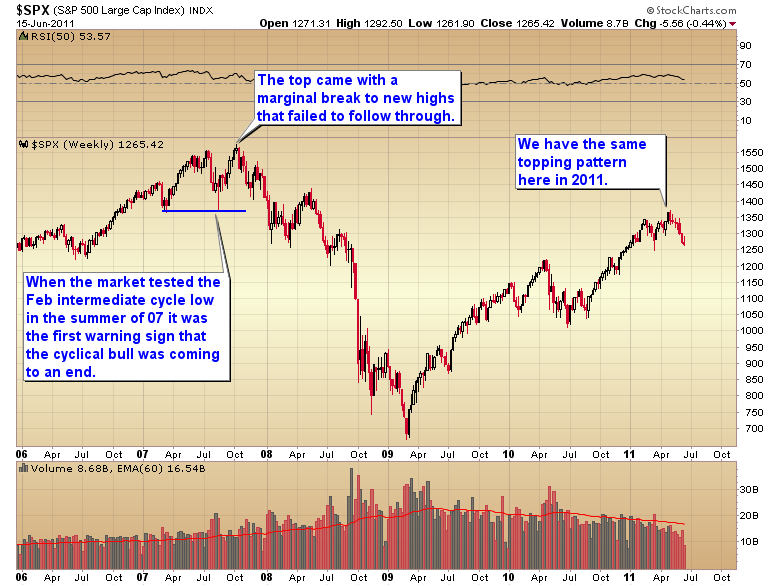 And now the cyclical bull has topped with that exact same reversal pattern in 2011. This isn’t the only warning sign unfortunately. 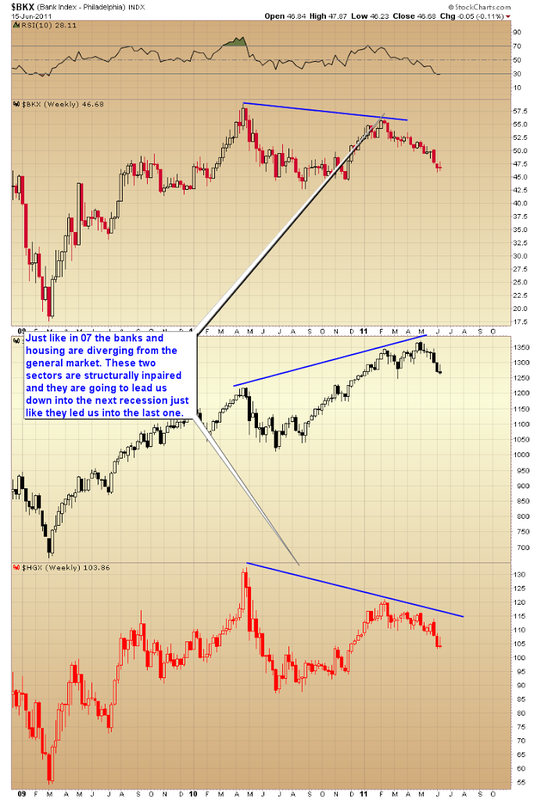 The banks and housing have been diverging from the rest of the market for some time. These two sectors are still impaired and will remain so no matter how much money the Fed throws at them. They led the market down into the last bear and they are leading it into the next bear. Here is what I expect to happen over the next two months. We should soon test the 1249 intermediate cycle low. Actually I think we will probably marginally break below that level. As most of you probably know by now breakdowns and breakouts almost always fail to follow through. 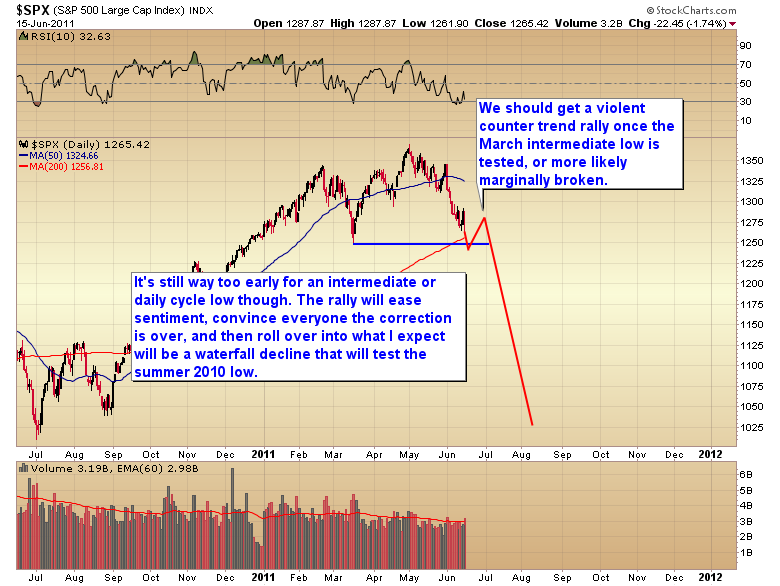 So I expect we will see a violent counter trend rally once the March low is penetrated. That should wipe out all the technicians who sell into the breakdown. However the rally, although I’m sure it will be convincing, will almost certainly be a counter trend affair that will quickly fail. The problem is that the current daily cycle is only on day 12. That cycle on average runs 35-45 days trough to trough. So once the counter trend rally has run it’s course we should have another leg down. And that leg down will almost certainly cause tremendous damage to the global stock markets. Once the market penetrates the coming low it shouldn’t be long before traders recognize that something is terribly wrong. At that point everyone is going to head for the exits at the same time which should lead to some kind of waterfall decline bottoming around the middle of August. This is when I expect Bernanke to freak out and initiate QE3. I have no doubt the market will rally violently on the news as traders have become conditioned to expect QE to drive stocks higher. 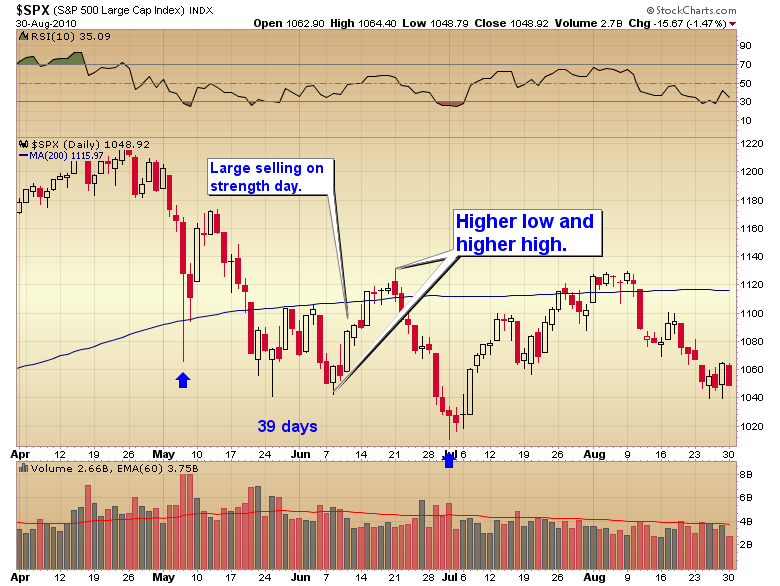 I expect we will see the market test and maybe even penetrate the 200 day moving average during the fall rally. However this too will only be a counter trend affair. QE is the cause of our problems and more of it isn’t going to make things better, it will only make them worse as it will start to spike commodity prices again into a rapidly weakening economy. Remember spiking commodity inflation is what caused this in the first place. Doing it again as the economy rolls over into recession is only going to guarantee that this turns into a depression instead of just a severe recession. Traders and investors need to start preparing for what’s ahead. If you ignored me previously and are still invested in the general stock market, exit, either now, or into the rally that should come off the March lows in the next week or two. Don’t get fooled by the analysts who will be telling you the correction is over, it won’t be. This won’t be over until late July or early August. Get back into dollar denominate assets as the dollar will continue to rally and gain purchasing power in a deflationary environment. Once it’s appropriate we will transfer assets back into gold and precious metals, but it’s still too early for that. Gold needs to move down into an intermediate cycle low before we want to buy. My best guess is gold will dip down to somewhere around $1400 over the next 4-5 weeks. I am monitoring not only the stock market but also the gold cycle in the premium newsletter and will let subscribers know when I think it’s time to get back into precious for the next ride up. For the next week I will re-open the 15 month subscription special. Click here to go to the premium website. Then click on the subscribe link on the right hand side of the home page to go to the subscription options page. If you are on a monthly subscription and wish to upgrade you can do so by following the directions on the website home page to cancel your monthly subscription. Then purchase a 15 month subscription. It will automatically start once your monthly subscription expires. You must cancel your monthly subscription by following the cancellation process detailed on the website for this to work.